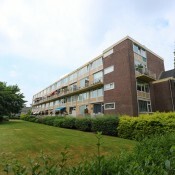 In Hilversum-South we offer you this three-bedroom apartment on the third and fourth floor. The 76 m² apartment has a balcony and a separate storage room. A shopping centre, several roads and public transport are just a few steps away. This well-kept apartment is located in a good apartment complex. Layout: On the third floor you enter the apartment through the storage room. The hall with separate toilet and staircase takes you to the living area of the apartment. Via the living room you have access to the sunny balcony. Adjacent to the living room you will find the modern open kitchen equipped with all needed appliances such as a gas cooker with oven, dishwasher, hood and fridge/freezer. On the fourth floor there are three bedrooms of which a very spacious master bedroom in front of the apartment. The modern bathroom comes with a spacious walk-in shower, sink and towel radiator. In short, a lovely apartment in a convenient location! 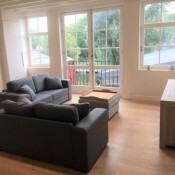 Beautifully renovated and furnished 1 bedroom apartment in the cosy centre of Laren. 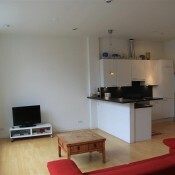 The apartment is modern and has a very spacious and bright living room. The new modular kitchen has a "professional look" is fully equipped with everything you need. There is a bright and spacious bedroom. The bathroom has a very luxurious look and is equipped with a bath with shower. The balcony is located on the south. The location offers many cosy shops, tasty eateries and all nice cafes and bars within walking distance. Hilversum train station is a 15-minute bike ride away and Amsterdam can be reached within 30 minutes by car and Utrecht is 23 minutes away by car. 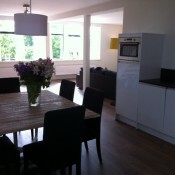 Lovely renovated furnished 2 bedroom apartment in the cozy centre of Hilversum. The train station is only 2 minutes walking and the train will bring you to Amsterdam in 23 minutes and to Utrecht in 15 minutes. The apartment has a modern style and a bright living area. he new kitchen is fully equipped with everything you need like dishwasher, oven+microwave, 5-burner gas stove, fridge etc. There are two spacious and comfortable bedrooms. The bathroom, with a bathtub and a separate shower has a very luxurious look and finishing. When renovating only high quality materials have been used which has given this property a very luxurious look and feel. This apartment has a lovely and sunny roof terrace, where you can enjoy the sun. In the heart of Amsterdam, a very nice and cozy 1 bedroom apartment located on the first floor of a former orphanage, which has a “ Rijks Monument” status comes available. The apartment is fully furnished and situated next to the" Amsterdam's Museum" and is within a stone's throw of Amsterdam's main shopping street: the "Kalverstraat". Nevertheless the cozy apartment is peaceful and quite, due to the monumental double-glazing in front and back and the wall/ceiling and floor insulation. The whole apartment is recently renovated, has parquet floors and is very light as it has 4 windows in the front and 2 in the back. The apartment has high ceilings with visible beams and has a contemporary luxury style. It contains: 1 modern and fully equipped kitchen 1 living-room, 1 separate toilet, 1 bathroom with shower and bath and 1 bedroom at the backside. Beautiful and spacious (approx. 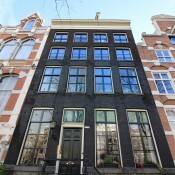 120sqm) furnished apartment located in a quiet street in the city centre of Amsterdam! Lay-out: The spacious en-suite living is situated at the front side of the apartment and is provided with two large windows. The dining area and open kitchen are situated at the back side. The kitchen is provided with all modern built-in appliances such as a dishwasher, combination oven/microwave and a refrigerator/freezer. Basement: Very spacious bedroom with floor heating and two windows at the front side. Luxcurious bathroom (also with floor heating) which is provided with a bath tub (jacuzzi), separate shower and double washbasin. 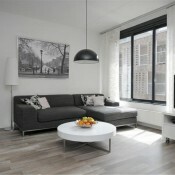 The apartment is located on a very nice location in the middle of the centre of Amsterdam. Lots of stores and restaurants are walking distance. Rent price is incl. cleaning every 2 weeks. € 1.850,- incl. advanced payment of € 150,- for g/e/w, € 50,- for TV/internet. Beautiful and high quality renovated apartment (furnished) with 2 bedrooms located on a very popular location nearby the Jordaan area and the Amsterdam Central Station. Entrance, staircase to the second floor. When entering the apartment you will directly step into the living room which is provided with 3 large windows. The open dining area is situated next to the living area. The luxurious kitchen is provided with all modern built-in appliances and is situated at the back of this open room. The master-bedroom is situated at the back side of the apartment and is provided with a built-in closet. The second bedroom is provided with a double bed and a large built-in closet. The luxurious modern bathroom is situated between the both bedrooms and is provided with a shower, bath tub and washbasin. 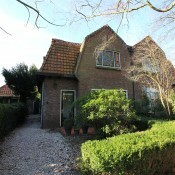 Location: The apartment is located at a popular location nearby Amsterdam Central Station. A variety of shops, cafes/restaurants and supermarkets are located within walking distance. The Prinseneiland is easily accessible with a car, public transportation or bicycle. Unfurnished 2 bedroom apartment on the first floor, accessible by stairs or elevator. Located in the complex Westerkaap, built in 2008 and well insulated. On this floor is only one apartment located, which makes it very private. The property has 2 bedrooms and is very light and even brighter if you open the sliding windows, it has a nice light floor and the luxury kitchen is both comfortable and practical. The pantry has the size of a small bedroom and has sufficient space for a large freezer too. There are two big, almost equally sized bedrooms. The bathroom has a large shower with fixed spout and hand shower, sink and towel radiator. Toilet is separate. There is also a separate large hall closet, a.o. for washer and dryer. 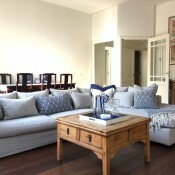 The apartment is minutes away from the Jordan, the Haarlemmerstraat and Noordermarket. Central station, restaurants, supermarket and shops are within walking distance. The exit roads are also easily accessible from the house. Furthermore you will have both a private storage and a communal bicycle storage in the basement. No smoking, no pets. 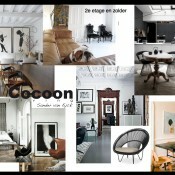 Beautiful 1-bedroom apartment of 80 m2 in a unique place in the Drie Koningen in Amsterdam. The apartment is located in the center where many shops, restaurants, leisure and cultural activities can be found. Lay-out: via the large hall you enter the apartment where you walk straight into the living room or on the left the bedroom with ensuite bathroom. In the hall there also is a separate toilet and a storage room with washer-dryer combination. The kitchen is connected to the living room where you have nice view on typical Amsterdam houses. From the living room you have access to a covered balcony. The rent is excluding parking costs. 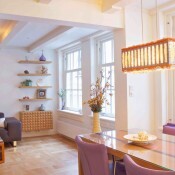 Beautiful 1-bedroom apartment of 80 m2 in a unique place in the Drie Koningen in Amsterdam. The apartment is located in the centre where many shops, restaurants, leisure and cultural activities can be found. Lay-out: via the large hall you enter the apartment where you walk straight into the living room, or on the left the bedroom with ensuite bathroom. The kitchen is connected to the living room where you have nice view on typical Amsterdam houses. From the living room you have access to a covered balcony. In the hall there also is a separate toilet and a storage room with washer-dryer combination. You can also use the indoor swimming pool, sauna and fitness room which you can find in the basement. The rent is excluding parking costs. 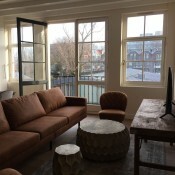 Beautiful and high quality renovated apartment (furnished) with 2 bedrooms, located on a very popular location nearby the Jordaan area and the Amsterdam Central Station. Layout: The entrance is on the ground floor. When entering the apartment you will directly step into the spacious living room with a luxurious open kitchen which is provided with all modern built-in appliances. The washing machine is also situated in the kitchen. The large dining table is connected to the kitchen counter. You will look over the cozy and bright living room. There are 2 large bedrooms situated at the back of the apartment. Both bedrooms are provided with a large closet and bathroom with a separate shower and bath tub. 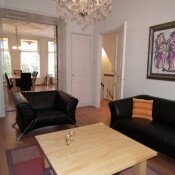 Location: The apartment is located at a popular location nearby Amsterdam Central Station. A variety of shops, cafes/restaurants and supermarkets are located within walking distance. The Prinseneiland is easily accessible by car, bicycle and with the public transportation. Beautiful and high quality renovated apartment with 2 bedrooms located on a very popular location nearby both the Jordaan area and the Amsterdam Central Station. Lay-out: Entrance with staircase to the third floor. The spacious living room is situated at the front side of the apartment and at the back of this nice open space is an luxurious open kitchen situated which is provided with all modern built-in appliances. From the kitchen you will overlook the cozy living room. The large dining table is connected to the kitchen counter. The master-bedroom is located at the back and is provided with a large closet. The second bedroom has a double bed and large closet. The luxurious modern bathroom is provided with a shower, bath tub and washbasin. A seperate toilet is situated in the hallway. 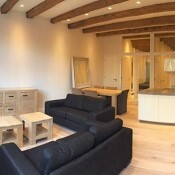 Location: The apartment is located at a popular location nearby Amsterdam Central Station. A variety of shops, cafes/restaurants and supermarkets are located within walking distance. The Prinseneiland is easily accessible with a car, public transportation or bicycle. Newly (2018/9) renovated 5 bedroom, 2 bathroom end of terrace house with south facing garden, garage and ample storage in very child friendly setting near good (international) schools less than 30 minutes from Amsterdam and Utrecht. The house features 5 bedrooms and 2 full sized bathrooms. The large ground floor provides good space for family living and entertaining with enough room for a large dining table. The kitchen is well equipped with a large cooking/washing island including a wine cabinet cooling system, 2 ovens, fridge/freezer dishwasher and induction cooking system, boiling water system. On the first floor you will find 3 bedrooms and a spacious family bathroom with under floor heating, towel heating radiator, walk-in shower, double washbasin with storage space, toilet. On the 2nd floor there is a full bathroom with space for washing machine and a drier, 2 further good sized bedrooms, each with a large dormer and a storage space, which is equipped with a new central heating system. 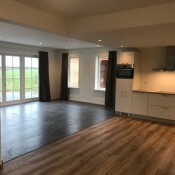 The recent renovation also included the renewal of floors, re-plastering of walls, new central heating, fully insulated to the highest standards and is inclusive of 16 Solar panels (Energy label A, which means low gas/electric cost). Just unpack your suitcases and move in! Location: The house is situated in a green, quiet, child-friendly cull-the-sac in the town Bussum, With 2 train stations Bussum Zuid en Naarden Bussum and motor ways A1 and A27, both Amsterdam and Utrecht are less than 30 minutes away. In walking distance there are lovely play areas, plenty of nature and shops. The nearby centre of Bussum is compact and well equipped with a full range of shops. Bussum offers a great selection of primary and secondary schools with the International school located less than 10 minutes away in neighbouring Hilversum. - Recently renovated end of terrace house with good sized garden - Luxury and modern finish - Large fitted kitchen with full range of appliances - 2 Fully equipped bathrooms, 5 bedrooms - Total living space over 135m2 - Living room with wooden floor, log burner and steel doors - South facing garden - Quiet cul-the-sac location - Full garage and separate shed - Near very good (international) primary and secondary schools - Excellent rail and motorways connections. If Owners can provide (soft) furnishings if wanted. Located in the popular 9 streets area in the city centre of Amsterdam is this beautiful furnished apartment (120 m2) with 2 bedrooms and 2 bathrooms. The apartment has been recently renovated and has two 5 meter high windows at the front side that provide a lot of light. The apartment has many characteristic elements and is fully furnished. The apartment is provided with: A spacious living room with a ceiling of 5 meters and a working chimney, an office space, a modern kitchen which is provided with all modern built-in appliances, separate toilet. The master-bedroom is provided with a 4 meter high built-in closet and a en-suite bathroom. The luxurious bathroom is provided with a bath tub, a separate shower and double sink. The second spacious bedroom is situated on the mezzanine and also has a en-suite bathroom. The second bathroom is provided with a large rain shower and glass sink. A laundry room with a washing machine and dryer is situated in the basement. This furnished large 2 bedroom apartment is recentrly renovated. The apartment is very close to both the highway and the WTC. It is possible to relax or shop in the very nice shops and restaurants surrounding the apartment. You can escape city life in the nearby and very nice Beatrixpark. This two bedroom apartment is, as previously mentioned, newly renovated and in high standard. The kitchen is brand new and fully equipped. Wooden flooring has been fitted throughout the whole apartment. The balcony is facing south. A parking permit can be obtained immediately with this apartment! Beautiful and good located detached villa with views over the fields and forests. The total renovation is as good as finished so this house can be occupied very soon. A spacious L-shaped living room has French doors to a spacious terrace. The division of the windows and the fireplace provide a cozy / rural look. The brand new kitchen is fully equipped. A workroom and ample storage cupboard offer plenty of storage space, here are also the connection for washing machine and dryer. This location is very central to: Utrecht (12 km), Amsterdam Zuid-as (33 km, 34 min), International School Hilversum (6.8 km, 14 min), Violenschool (7.8 km). The train station Hollandse Rading is only 8 minutes by bike from the house and the train takes you in 49 minutes to Amsterdam Central Station. In short, a lovely, spacious family home where the peace seeker will enjoy it as well. Pets are allowed and it is undoubtedly possible to bring horses to one of the many farmers in the area. Layout: spacious sunny living room, 3 bedrooms with bathroom and separate toilet on the first floor, enough space to park two cars on site, barn is realized in the spring. Spacious and bright apartment in the centre of Amsterdam. The apartment is at the first floor, you enter the apartment in the hallway where you have access to all the rooms. De livingroom has big windows so you will have a lot of daylight during the day. There is an open kitchen in the living room that is fully equipped with an oven, microwave and a dishwasher. The apartment has 2 bedrooms and a nice bathroom with bath and a walk-in shower. The 3rd bedroom can be used as a study room. There is one small garden and roof terrace. 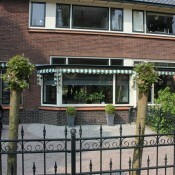 Charming and luxurious property with garage and large garden located in the beautiful village of Soest. The property has a total of 4 bedrooms on the second floor. Entrance with large hallway, staircase with access to the first floor, separate toilet. Living room with bay window that creates a lot of natural day light. The dining area and half-open kitchen are situated at the back side of the property. The modern, contemporary kitchen is provided with all modern, built-in appliances. Though the dining area you have access to the back garden via double opening doors. The first floor is provided with 3 bedrooms, 2 of them are currently in use as childrens rooms. The modern bathroom is provided with a bath tub, separate shower, toilet and washbasin. The property also has a spacious attic room with storage space and bedroom. In short, a lovely family house! Delivery in consultation. This is the perfect place to retreat, recharge and refresh after a day out and about. The living area is functional and full of thoughtful details with a comfortable couch. The charming kitchen if fully equipped with everything you need and has a homey vibe. Get an amazing night's sleep on the comfortable double bed, with a great view on the "Westertoren" and enjoy a warm shower in the modern bathroom. If you want to watch the stars at night or to enjoy your coffee in the morning, you can open one of the 7 Windows! Living in the middle of nature, and only 10 minutes away from Amsterdam with a large back garden, boat dock and a beautiful view! 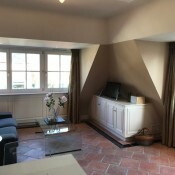 The property is located in a nice village with important facilities such as a school with day care, a doctor, a number of different shops and sport clubs. Lay-out: Entrance at the front side, spacious hallway, separate toilet with fountain, access to the living room. The stunning, spacious and bright living room with very high ceilings is truly magnificent! At the front side of the living area is a sitting area, in the middle is the living area with staircase to the first floor. The half open luxurious kitchen, provided with all modern built-in appliances, is situated at the back side of the property. A scullery/storage room is situated next to the kitchen. The back side of the property is provided with a large glass sliding door which provides a lot of natural light and gives access to the large, sunny back garden. The back garden has a shed and a boat dock which has access to an open waterway! The 3 spacious bedrooms are situated on the first floor, together with an open (office)space which can also be used for guests. From the landing you can see over the living area which creates a very spacious feeling. The large and luxurious bathroom is provided with a large washbasin, bath tub, separate shower and toilet. The property is also provided with a 1-car garage and carport. Location: The location and the view are beautiful and you almost feel like you are in a fairytale. From the garden and the boat dock you have a wonderful view! After approx. 20 minutes by boat you can reach other beautiful villages like Monnickendam. Ilpendam has excellent public transportation connections to Amsterdam. Every 10 minutes a bus stops in Ilpendam that drives to Amsterdam’s central station in 15 minutes. Quiet and spacious, close to Amsterdam. Best of both worlds! beautiful spacious and light apartment. The apartment has been renovated mid 2018 The designer made a special space with special walls (no stucco) with wood and tiles; she highlighted the height with old sliding doors; a kitchen made of labradorite from Madagascar. Soft leather lounge couche to relax... And instead of a wall she had made a steel construction with old glass.... The half door in the front where you watch the Jordaan street life; from your apartment or chill in the garden in the back with the 3 beautiful high doors... This is the perfect place to retreat, recharge and refresh after a day out and about. The living area is functional and full of thoughtful details with a comfortable couch. The kitchen if fully equipped with everything you need and has a homey vibe. Enjoy your coffee in the morning sun, you can do so in the private garden. Beautiful 4 bedroom villa with a nice garden in Hilversum South near the International School and close to both shopping and nature areas. In the beautiful South part of Hilversum, on walking distance from the Hilversum International School we can offer this characteristic semi detached villa. Layout: Hall with access to living, kitchen, toilet and basement. The living is L-shaped and has a nice fireplace. It can be divided in to separate sitting and dining rooms by closing the original sliding doors in the middle; From the dining room French doors lead you on to the terrace and in to the garden at the back. The kitchen is fully equipped, with a five burner stove, combination oven, dishwasher and fridge. Well designed stairway to the first floor, which has a landing,3 bedrooms and a spacious bathroom with steam shower, double sink, second toilet and jacuzzi bathtub. On the second floor you will find both the fourth bedroom and the attic with washer, dryer and storage. In the basement the modern central heating unit and a separate freezer are located, besides a lot of storage capacity. The royal size garden around the house is facing South, offers a lot of privacy and comes with a spacious shed for garden equipment, bikes etc. Just walking out the front gate of this property you will find both forest and heath: the Kolhoornse Heide, which is connected with a vast nature reserve. The nearby village of Loosdrecht offers all kinds of water sport activities and can be reached in 5 minutes. Short distance to main traffic arteries, both public transportation and free parking is in front of the house. Hilversum railway station is only 6 minutes from here. The lovely village of Laren is a 12 minutes drive; Utrecht (20 m), Amersfoort (20 m), Amsterdam (25 m) and Schiphol Airport (30 m) are easy attainable too. This property can be rented semi-furnished. Furnishing will be negotiable. Prinsengracht: Beautiful furnished 2 bedroom/2 bathroom apartment located in a monumental building with original high ceilings, wooden floors and design interior. Layout second floor: Hall with intercom and separate toilet. The bright living room with wooden floors, high ceiling and modern design furniture gives a great view over the canals. Kitchen is open plan and fully equipped with all appliances you will need. On this level the master bedroom with own bathroom with a bathtub, separated shower and sink are situated. Layout third floor: Nice roof terrace, second bedroom and second bathroom with shower and sink. Nice located along the canals and at the corner from the Westertoren. Good public transport and just 5 min to Central Station. On the ground floor there is an extra storage. Within 5 minutes walking, on Marnixstraat, is a parking garage, where a subscription is available immediately. Lovely large and modern half of double, fully furnished villa with 8 bedrooms and 3 bathrooms. Ideal for a family with au pair or older children. Close by International School in Hilversum. Also very suitable for a home-office or any other combination of living and working. The house comes with a garage and additionally parking space for at least two cars on private ground. You will find this semi-furnished large half of double villa in a quiet street, situated on walking distance from the centre of Bussum, with its variety of nice shops and fine restaurants. Within minutes you reach the highway to Amsterdam or Utrecht. Also,on walking distance you will have access to several nature areas like woods and nature reserves. Th Spandersbosch Golf Course and various other sports accommodations like 5 tennisclubs, 3 hockeyclubs and other sport accomodations are within a range of approximately 2 Miles. This villa is build in 2001, so it is very well isolated. It has a high standard of finishing and only top quality materials have been used to give this house its premium presence. When renting the house is currently offered semi-furnished, but furniture is negotiable. Lay out; Ground floor: entrance in hallway with toilet, staircase to both the upper floors and the souterrain floor. From the hall double doors will lead you to the royal size and bright L-shaped living room with fine fish bone parquet flooring and cosy fire place. French doors give access to the nice and private garden with several terraces, ensuring you always a good sunfacing area. The modern Siematic kitchen is fully equipped and comes with a six burner stove, large size oven, steamer, dishwasher, fridge and freezer. The scullery gives access to the garage and the storage above. Souterrain; hallway with pantry, modern bathroom with shower, toilet and sink and access to the 3 spacious rooms with high windows that allow the daylight to come in. This floor is very suitable for either apartment for au-pair or a combination of bedrooms with play- or study room or as a home office space. First floor; hallway with separate toilet, 3 large bedrooms and a modern luxury bathroom with bathtub, shower and double sink. Second floor; hallway with access to 2 full size bedrooms and a very convenient third bathroom with shower, toilet and sink. Location; this house is located in a residential area on walking distances of downtown shops, two trainstations, bars and restaurants. 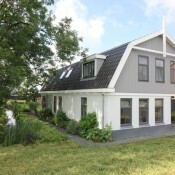 The International School of Hilversum can be reached within 15 minutes by public transport or by bike, which makes this house an excellent option for an expat family too, either with or without au pair. Beautiful renovated apartment (furnished) of very high quality! 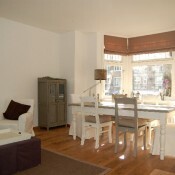 The apartment is provided with 2 bedrooms and 2 bathrooms located on a great location in the centre of Amsterdam. The apartment is situated on the second and third floor. 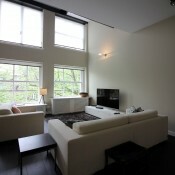 Second floor: The cozy living room is situated at the front side of the apartment. The living room is provided with 3 large windows which provide lots of natural light. The living room is also provided with a fire place. The luxurious open kitchen adjoins the living room. The kitchen is provided with all modern built-in appliances and overlooks the patio. The first bedroom can be reached through the hallway at the back side. The large bedroom is provided with built-in closets and has a view over the back gardens. Stairs to the third floor. Third floor: The second large bedroom is situated at the front side of the apartment. The second modern bathroom is provided with a shower, washbasin and toilet. The large terrace (facing South) can be reached through the large wardrobe. There is also a laundry room situated at this floor. Stairs to attic. The boiler room and a large storage room are situated on this floor. 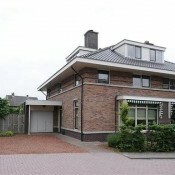 Parking possibility in nearby garage for around € 400,- per month.